The Texas Examinations of Educator Standards (TExES) Life Science 7-12 exam is an assessment of the required knowledge and skills you will need as an entry-level educator in Life Science, grades seven through 12. The Life Science exam is required, in addition to the Pedagogy and Professional Responsibilities exam, for teacher certification in the state of Texas. Selecting and managing learning activities to ensure correct use and care of organisms, natural resources, materials, equipment, and technologies. Unifying concepts in all sciences. The history of science, the impact of science on the lives of students, and the interaction and influence of science on personal and societal decisions. Understanding the structure and function of biomolecules. Understanding the structure and function of cells and their specialized functions. Understanding the life cycle of cells and their life process. Understanding the growth and development of specialized cells, tissues, organs, organ systems, and organisms. Structure and function of nucleic acids. The continuity and variations of traits through generations. The evidence of evolutionary change throughout Earth’s history. Similarities and differences between living organisms, and the taxonomic systems for organization and interpretation of the diversity of life. Living systems’ boundaries and limits. Understanding the relationship between biology and behavior. The relationship between abiotic and biotic factors of terrestrial and aquatic ecosystems, habitats, and biomes, including the flow of matter and energy. Ecosystems and their interdependence and interaction. Relationships between carrying capacity and changes in populations and ecosystems. Theoretical and practical knowledge of teaching science and scientific inquiry. Knowledge of monitoring and assessment of science learning in a laboratory, field, and classroom settings. To register for the Life Science exam, you will make an account online. Through your online account, you will pay the $116.00 fee (paid with a credit or debit card only) and select your testing date and location. Exams are offered by appointment, year-round, on a first come, first served basis. Testing centers are located throughout Texas and nationwide. You will be able to schedule your testing time when you register or within 170 days of registration. On test day, arrive 30 minutes before your scheduled time. This will allow you to have your identification verified and complete the necessary paperwork. Pay attention to the rules and requirements as failure to do so could result in the cancelation of your test, and your registration fee forfeited. At your testing station, the testing administrator will provide you with a note board booklet, erasable pen, and any other materials required for your exam. Within the five hour period is time for you to familiarize yourself with the testing delivery platform. Your results will be available in your testing account at 10:00 p.m. on the scheduled score report date and you may elect to have the results emailed to you. Your score is automatically reported to the Texas Education Agency (TEA) and your Educator Preparation Program (if applicable). Based on the number of questions answered correctly, your test is scored in the range of 100 to 300. 240 is required to pass this exam. You have invested a great deal of time and money to obtain the knowledge and skills necessary to be an effective teacher in Texas. The Life Sciences exam gives you the opportunity to demonstrate that knowledge and receive certification and requires you to prepare, plan, and study for the exam. 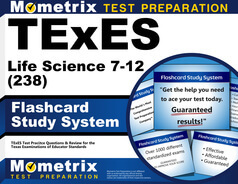 Mometrix has a proven study guide for the Life Science exam, and their flashcards will help you reach your goals. Their system is proven to help you obtain results, and their one-year, money-back guarantee is their confidence in the effectiveness of their system. You’ve worked too hard on your education; don’t let one exam keep you from your goals. Mometrix Academy is a completely free resource provided by Mometrix Test Preparation. If you find benefit from our efforts here, check out our premium quality TExES Life Science 7-12 study guide to take your studying to the next level. 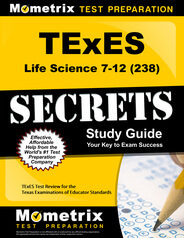 Just click the TExES Life Science 7-12 study guide link below. Your purchase also helps us make even more great, free content for test-takers.